According to this important new story over at The Nation written by Stephen F. Cohen, an expert on U.S.-Russian relations, a nuclear war between America and Russia is increasingly growing likely due to the 'RussiaGate' allegations being spewed by the left for the last two years. Warning immediately within his story that the new 'US-Russia cold war' is even more dangerous than its 40-year predecessor that our planet thankfully survived, Cohen then hinted we may be 'sleepwalking' into Armageddon, with the possibility of a nuclear catastrophe rarely discussed within the mainstream media nor mainstream political discussions. 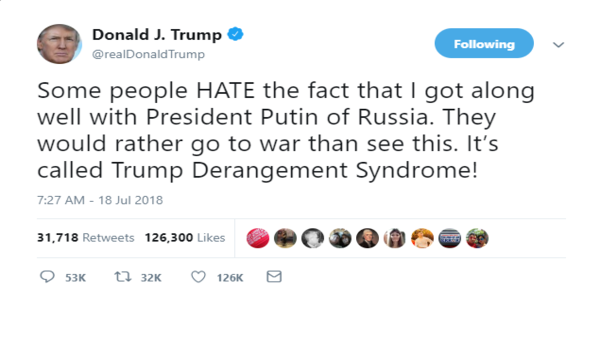 Warning then that the latter months of 2018 have been littered with a mounting series of crises that only continue to grow worse, he then outlines for us how the core 'Russiagate' allegations have become a central part of this new cold war, constraining President Trump from working with Russian President Vladimir Putin to help cool the growing tensions. And for those who somehow insanely believe that a war between America and Russia might be a 'good thing', as Dr. Peter Vincent Pry warned in this December 2nd story on ANP, even the United States military is finally warning about what such a war with Russia might bring in an extraordinary and sobering new report: nothing less than the end of 'America'. 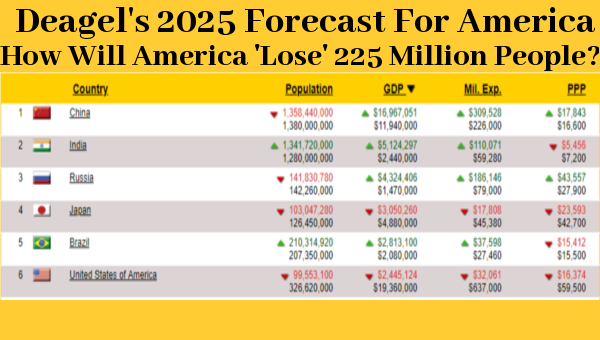 We've gone ahead and embedded the US military's new report in full at the bottom of this story for all to read if you haven't yet had the opportunity but be forewarned, the results show an America looking much closer to what the globalist-linked website Deagel.com is forecasting for America in 2025 than the America we live in today in 2018. As we've previously reported on ANP, without even detonating a nuclear weapon in a US city, Russia, China, Iran or terrorists who've gotten a hold of a nuclear weapon could inflict massive carnage upon America by exploding a nuclear weapon high over America. And as former Green Beret Jeremiah Johnson recently reported within this story over at SHTFPlan, he considers an EMP or nuclear war to be two of the three methods that the globalists may eventually use to usher in their 'end game' for America with the third method being a lethal, bio-engineered virus to help cull the masses. According to this new story over at the Daily Mail that Steve Quayle had linked to on his website on Tuesday, Russia has just launched 5 new satellites into space and experts fear that they could be part of a new Russian secret weapon, weaponized to be used to destroy other satellites. And while their story didn't mention the satellites being used to deliver a nuclear weapon or EMP attack upon America, Dr. Pry and the US Congressional EMP Commission had previously confirmed that orbiting satellites could be used to do just that. And while ANP hasn't fallen for the propaganda making the rounds within the mainstream media that Russia is our dire enemy who wants to destroy us (they do realize that them dropping nukes on US soil means American nukes exploding upon Russian soil as well), we'll agree with Johnson that the 'globalist enemies of America within' are likely more danger to Americans than Russia ever will be, with Trump derangement syndrome pushing them and our world towards insanity. As we'd previously reported on ANP, should the corrupted faction of the deep state be held accountable for their myriad crimes against the American people, we'd expect nothing less than a burnt Earth take no prisoners attitude from them and with the globalists hands also elsewhere, such as the Ukraine, we wouldn't put it past them pushing the US into a war defending the Ukraine against Russia, possibly being the final straw that broke the camel's back. So with a nuclear war against Russia potentially as close as we've ever seen in our lifetimes, we'll close with several important excerpts from Club Orlov and their story "A Russian Warning", a story that while written back back on May 31st of 2016, prior to the presidential election, is still as relevant or more so now, at this very moment, than ever before. We, the undersigned, are Russians living and working in the USA. We have been watching with increasing anxiety as the current US and NATO policies have set us on an extremely dangerous collision course with the Russian Federation, as well as with China. Many respected, patriotic Americans, such as Paul Craig Roberts, Stephen Cohen, Philip Giraldi, Ray McGovern and many others have been issuing warnings of a looming a Third World War. Thus, if tomorrow a war were to break out between the US and Russia, it is guaranteed that the US would be obliterated. At a minimum, there would no longer be an electric grid, no internet, no oil and gas pipelines, no interstate highway system, no air transportation or GPS-based navigation. Financial centers would lie in ruins. Government at every level would cease to function. US armed forces, stationed all around the globe, would no longer be resupplied. At a maximum, the entire landmass of the US would be covered by a layer of radioactive ash. We tell you this not to be alarmist, but because, based on everything we know, we are ourselves alarmed. If attacked, Russia will not back down; she will retaliate, and she will utterly annihilate the United States. 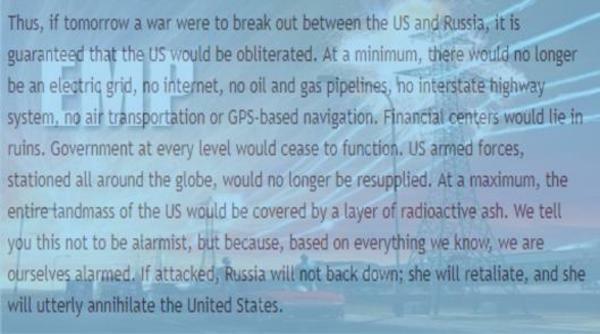 And like the somber note delivered by the US military of America's destruction, their story concluded much the same, while telling the world outright that Russia has no intentions of attacking the US or any EU member state, unless they are attacked first. We are absolutely and categorically certain that Russia will never attack the US, nor any EU member state, that Russia is not at all interested in recreating the USSR, and that there is no “Russian threat” or “Russian aggression.” Much of Russia’s recent economic success has a lot to do with the shedding of former Soviet dependencies, allowing her to pursue a “Russia first” policy. But we are just as certain that if Russia is attacked, or even threatened with attack, she will not back down, and that the Russian leadership will not “blink.” With great sadness and a heavy heart they will do their sworn duty and unleash a nuclear barrage from which the United States will never recover. Even if the entire Russian leadership is killed in a first strike, the so-called “Dead Hand” (the “Perimetr” system) will automatically launch enough nukes to wipe the USA off the political map. We feel that it is our duty to do all we can to prevent such a catastrophe. So we urge ANP readers to please pray for a return to sanity for America and the planet with life as we know it sure to come to an end instantly for 325+ million Americans should nuclear war break out between the world's 2 global superpowers and potential extinction hanging in the balance should 99 nuclear power plants in America go into meltdown.